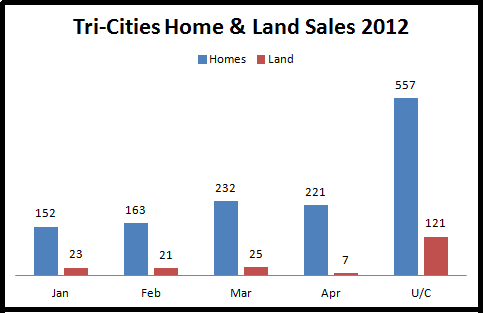 The numbers are in for Tri-Cities home and land sales for April 2012. We pulled from sales in Richland, West Richland, Pasco, and Kennewick. April sales currently register at 221 houses sold and 7 lots sold. These numbers are likely to increase as the MLS listings are updated to “sold” status. Stats are looking great for May sales, with 557 single family homes and 121 land sales currently under contract! See more historical Tri-Cities stats at 1st Quarter 2012 Real Estate Stats. One of our listings is currently under contract and we’ve seen an increase in showings on all our listings. Please let us know if you’re interested in knowing more about the current market or the value of your home!